Got Itchy or Sore Paws? Winter is over here & the road salts have for the most part been swept up. But even in this warm weather we dogs can get sore & irritated paws from walking about. If your dog begins licking the paws incessantly, they are telling you their paws are irritated. You should consider foot soaks after walks. Your dog’s feet are bare, moist, & your dog is running through grasses, mud, streams, & who knows what else. All of these environments can expose your dog’s paws to microscopic allergens, as well as pesticides, herbicides, & other chemicals. Where I live, sand is an issue. If you don’t remove these contaminants from their paws, they can become very sore & licking can dry them out. Povidone iodine or Betadine® solution are naturally anti-fungal, antiviral, non-stinging, non-toxic, and non-abrasive. They are a very effective disinfectant for your dog’s paws. You can give your dog’s feet a quick soak in a sink or small bowl after walks or you can simply wipe them with the same solution. Be sure to pat the paws dry afterwards. If your dog has cuts or yeast (if your pet’s feet smell like corn chips), Betadine® is the very best solution. If your pet’s paws are just irritated, consider adding chamomile tea bags to the soak water, which has natural soothing properties. Half a cup of vinegar per gallon of water is another great topical disinfectant. I do not recommend that you apply cream, salves or dips, but to keep the paws clean and dry. Although ointments may soothe the paws, they don’t do an adequate job of disinfecting, or removing contaminants. 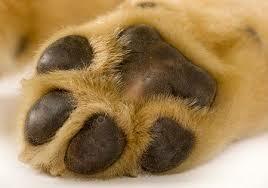 Ointments also increase the stickiness of the paws, attracting more contaminants, in many cases.